Recently the above message came to me via twitter from Annemarie Hyde. Of course I responded with a yes and here is my Eduigniterotovegas presentation. I shared about TeachMeetNZ and about the amazing connections I have made with New Zealand educators. I shared about the site being a collaborative product and how proud I am to have nearly 30 mini presentations available for anyone to come, view and share. It was great to have Marnel Van der Spuy as master of ceremony at the Eduignite and to see her in this leadership role all the way in Rotorua via Google Hangout. Because I was presenting I needed to have practise sessions and was grateful to @cossie29 and to @BeLchick1 who spent time with me in a Hangout so that I could practise my part of activating shared screen and showing my own presentation. I did miss having @kathyscott25 with her rattle snake to remind me of time. To be honest I am always hosting a Google Hangout Session but I have never really presented. I have been hosting TeachMeetNZ sessions for nearly a year now and the sessions allow New Zealand educators to talk to each other. The sessions are like being in a conference yet more like when you meet over coffee with your educator friends. 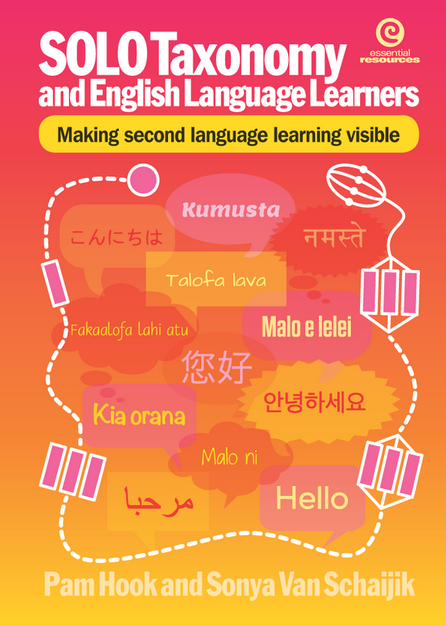 That kind of sharing of practice is a fabulous way for New Zealand educators to use technology to talk together. TeachMeetNZ shifts the focus of conferences because now we do not have the restrictions of time, space or paying to attend a conference. 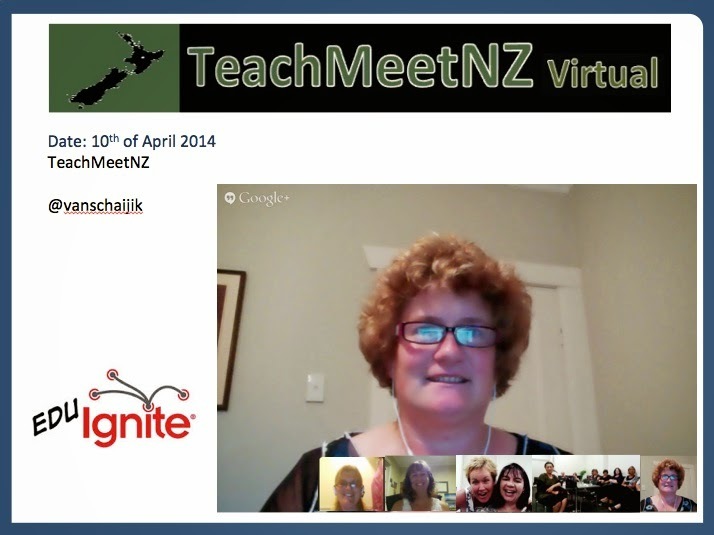 The exciting part of TeachMeetNZ is the ability of a teacher presenting to other teachers. Yet the experience is not just for the teachers who attend or who tune into a session but also for the teachers who presenting. I did not realise the value of this until I myself presented at Eduigniterotovegas via Google Hangout. Sharing via Google Hangout provides opportunities for educators all over New Zealand to share their expertise with other educators and this is not restricted by time, venue or location. As @annekenn would say ‘It’s Magic.’ The ‘Magic’ is for educators to share with each other as she did so well recently when she highlighted TeachMeetNZ at #Educampdunners. There is no selection process for a TeachMeetNZ session and I am proud of the fact that anyone can share. Generally, I tag people on twitter who have shown an interest and often I am asked if they can join a session. Every session new ideas come in. As a host I have learnt so much listening to each educator share their passion, practice, expertise and ideas from around New Zealand. I feel elated every time especially when I see people from all over New Zealand connecting and then from outside of New Zealand sharing the sessions. So for you audience come and join a TeachMeetNZ sessions and watch. Come and see how much fun it is to meet other educators and have deep meaningful conversations. Start by being a lurker and rewind the learning. Follow the conversation on twitter using the #TeachMeetNZ hashtag. I believe TeachMeetNZ is something of significant value to the New Zealand educators scene and I am excited to be presenting a special anniversary session on the 3rd of May. I already have a glimmer of running a full virtual national conference because I can see how to use the Google Hangout tool with the questions and answer features activated. To finish with, when I was waiting for the session to begin, I felt excited at seeing @teachernz and @barbs1 out there in the Rotorua audience because they are part of both my online learning world as well as my face to face learning. I enjoyed presenting via Google Hangout and welcomed the opportunity to be part of the process instead of directing the event. Steve Hargadon’s video provided me with lots of inspiration for this post.